Bratislava city is the capital of the Slovak Republic and political, cultural and economic centre of Slovakia. The city is located in central Europe in south-western Slovakia, occupying both banks of the Danube River situated on the foot of the Little Carpathians Mountains and on the beginning of the Danube Lowland. Its population counts 420 000 inhabitants plus ca. 150 000 – 200 000 daily commuters. Bratislava is a signatory of the Covenant of Mayors (2012), Mayors Adapt (2014), and pays its strong commitment to sustainable city development and urban planning, climate change resiliency and urban water agenda. In the past 10 years, the city experienced risk from heat waves, drought, fluvial and pluvial flooding, and extreme weather events. Implement green and soft adaptation measures to maximise the use of rainwater and green infrastructure. Bratislava city commitment to the city climate adaptation has started in 2008, when the priority of adaptation to climate change was integrated into the core strategic document of the city – The Social and Economic Plan. Later, the commitment was declared also on an international level after 2012 when the city signed the EU climate change adaptation strategies – the Covenant of Mayors (in 2012) and the Mayors Adapt (in 2014). - Project “Bratislava is preparing to the climate change – the pilot application of the measures in the field of the sustainable rainwater management in urban area” (co-funded by the EEA Financial mechanism grant, realization 2014-2017), which besides the adaptation measures included also development of the Action plan of Bratislava city area for climate adaptation (approved by the city council in 4/2017) as well as communication activities with institutions, NGOs and public. - “RESIN - Climate Resilient Cities and Infrastructures” - interdisciplinary, a practice-based research project investigating climate resilience in European cities project co-funded by the EU Horizon 2020 Programme (realization 2015-2018), where Bratislava is one of four case cities of the project (Bratislava, Bilbao, Paris, Manchester). Through co-creation and knowledge brokerage between cities and researchers, the project is working on developing practical and applicable tools to support cities in designing and implementing climate adaptation strategies for their local contexts. The project aims to compare and evaluate the methods that can be used to plan for climate adaptation to move towards formal standardization of adaptation strategies. Since mid-20th-century changes in climate change related hydrological patterns and temperature patterns are evident in Slovakia. Just in the last three decades, the average temperature rose by 0.5°C and the number of tropical days has doubled. In regions with lower altitude and lowlands, such as Bratislava region, the increase in average temperature doubles. According to the Slovak Hydrometeorological Institute, Bratislava region suffered the consecutive period of drought in 2016 and 2017 since 1981. The outlook is not very positive either. According to the climate change scenarios developed by the same institute, the average temperature will continue to rise to 2°C - 4°C until end of 21stcentury. In other words, where the 30ties used to be common feature of some of the summer´s hottest days, soon it will be temperatures in the 40ties. In addition, the decrease in rainfall is expected to continue, by the end of the 21st century it is expected that the majority of Slovakia´s territory will suffer from increase of long-term average surface run-off of - 40%. With most of the surfaces in cities being sealed these will become extremely vulnerable. In addition to natural hazards, one needs also to consider the present and future socio-economic factors, such as ageing population and daily migration and dependence on fossil fuel-based transport in both public and individual passenger transport. Therefore, the vision of the Strategy of adaptation to climate change in Bratislava is that the city will gradually implement the necessary adaptation and mitigation measures to eliminate the impacts climate change to ensure adequate quality of living and natural environment, protection of health, property and long-term conditions for the quality of life of the citizens and visitors of the city, in active cooperation with external partners and city residents. In Bratislava the adaptation approaches reflect the seriousness of impacts caused by heatwaves followed by occasional intensive rainfall and periods of droughts, with the need to secure sustainable living conditions and integrate adaptation approaches into other sectoral policies and strategic documents of the city. Therefore, the specific goals outlined in the strategy and action plan for adaptation to climate change focus on the following making the city and its inhabitants more resilient by decreasing vulnerability of relevant sectors, increase the awareness of lay and expert public, integrate adaptation into strategic planning and regulations and link adaptation and mitigation options – especially in areas such as energy, built environment, land-use planning and environment and biodiversity. The subsidy scheme for the purchase of rainwater management installations was taken up by the Covenant of Mayors initiative as one of the good practice examples for supporting the implementation of nature-based solutions on building level. By this subsidy the city encourages private home-owners to contribute to protecting the city from pluvial floods and property from damage. The goals are to motivative people to participate in climate change adaptation with support from the City´s budget since 2016. The maximum contribution is 1000 € per applicant or 50% of the total cost of the rainwater measure (project). 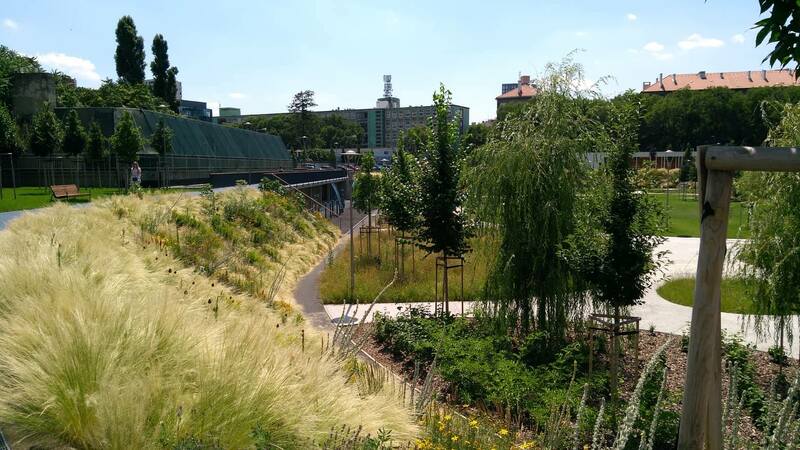 Majority of implemented projects/measures represent different forms of SUDs, green roofs or rain gardens. Mind the time management: planning – administration (!) - realisation phase. Planning: involve specialists or experts from different fields to avoid future complications in the realisation phase and setbacks on the pathway. Communication: not only towards the public but also towards other governance bodies and municipal organisations. Learning by doing: for example using a subsidy system to support implementation of adaptation measures on the household level or private sector. Bratislava is running a subsidy scheme for supporting sustainable use of rainwater. Co-creation: can be done with research organisations, but also together with the citizens – for example: participatory designs of new public spaces which can contribute to better quality of living but also help reduce climate change risks. Learning from peers: engage in networking with other cities – it is a great way of learning. - Bratislava city Small grant system for climate change adaptation measures on the household level: implemented by Bratislava city since 2016 with annual budget within the city funds budget up to 40 000 €. Eligible applicants: private homeowners, NGOs and businesses. The grant covers a maximum of 50% of total costs for the small project implementation.